Stylish off white tunic top with gold zip detail. This floaty tunic top benefits from an asymmetrical cut hemline that hits at the hips for flattering coverage. 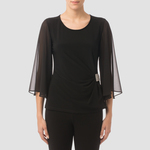 It has a V neckline detailed with a gold zipper and several front sheer overlays creating a shrug like effect. 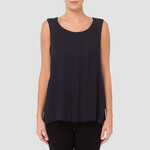 This wearable top also features a half sleeve.